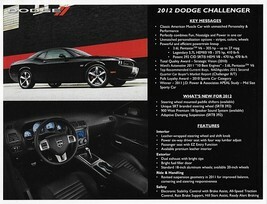 2012 Dodge Challenger US Introductory Sales Brochure! 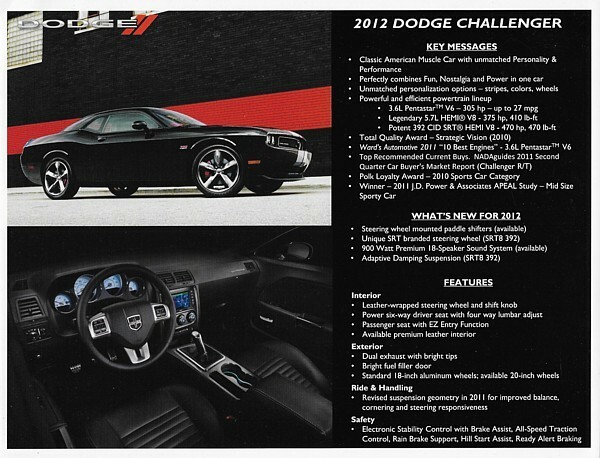 This listing is for a HARD-TO-FIND sales brochure specific to the 2012 Dodge Challenger SXT, R/T, R/T Classic and SRT8 retro-fabulous pony-car sport coupes! This item appears to be geared mainly to dealership sales personnel, with details about product updates and key messages as opposed to beautiful photography, This 2-sided color sheet is approximately 11"x8.5", and features no form number or printing date. This LONG OUT-OF-PRINT item is in GREAT showroom condition, bright and clean with no rips or creases! PLEASE READ BEFORE BUYING: The following information describes the purchase details -- PLEASE DO NOT BUY UNLESS YOU AGREE TO THESE TERMS! TERMS OF SALE: Total payment due includes the selling price and shipping cost listed above. Please note that this fixed cost may be substantially more than the actual cost of postage because it includes all packaging materials and labor involved in getting the parcel to you safely and securely. I currently accept payments via PayPal and Amazon Checkout, and items generally ship within 72 hours of payment confirmation. I always ship via USPS with Delivery Confirmation to help prevent the chance of shipping loss or damage. Please check out my other booth items and AVE on combined shipping costs! THANK YOU for reading -- and for visiting Autonutt's AUTO 411!